Not all coyotes are experiencing the intense drama you’ve been reading in some of my recent postings. Some have been leading calm and routine existences, without notable incidents except for dogs, and here’s such an example I observed last month. I find the female snoozing in a large field. Eventually, slowly, she gets up and stretches and wanders off, foraging as she goes. The evening looks to be a very routine one, which is what I want to post here. Soon a siren sounds. She sits down and begins her yipping in response, and then her mate joins in, even as he is hidden from view in the close-by thicket edging the field. He emerges from the thicket as their chorus ends and looks around until he spots her. Ahhh, there she is! He does a lot of marking and looking around, and both coyotes continue foraging, maintaining a substantial distance between themselves. He keeps glancing over at her, more than usual because it’s mating season — his protective and possessive instincts are in overdrive. Dogs are always around in this park, and today is no exception. During mating and then pupping seasons, coyotes are particularly protective of themselves and their mates or families, so it’s important to keep dogs away from them. This is easy to do: the minute you see a coyote, shorten your leash and walk the other way. A small unleashed dog appears in the not-far distance coming in the direction of the male who, therefore, kicks dirt. Kicking dirt shows he doesn’t like the situation, that he’s angry. Nevertheless, he moves off and out of the dog and walker’s way. But when the dog, who had been oblivious to the coyote finally sees the coyote, he runs several feet towards the coyote and starts barking. This all takes place at a distance of about 100 feet. The coyote turns around to face the barking dog and begins walking in their direction: the coyote is responding to the dog’s challenge. I ask the owner to leash, and they head the other way. Note that it would have been a much calmer situation had the owner leashed the minute she saw the coyotes and simply walked on. The coyotes continue on their way with the male sniffing and marking the ground continually. Kicking dirt shows he doesn’t like the situation with the dog approaching, nevertheless, he moves away and out of the dog and walker’s way. Soon, the female stops foraging and heads off on a path and the male follows not far behind, continually marking. They walk more parallel than together. When they reached a larger field within the park, the female somehow captures a bird within the blink of an eye. I’ve seen coyotes catch birds a number of times, and its almost always an injured bird on the ground. This seems to have been what happened here because she expended no effort in the process. She begins devouring it right away. The male, forever curious about everything the female does, comes towards her to investigate. Ahhh, she knows about his tricks (he has taken things she dropped) and so she walks away from him as she finishes off the bird. The coyotes keep moving along. They have a direction in mind — it’s one of several paths they routinely take as they head out trekking for the evening. But soon they stop: half a dozen people and dogs are lingering on their intended pathway, so now the two coyotes find a place to hunker down and wait-it-out until the path is clear. The coyotes are in no hurry and they know from experience that, as dusk thickens, dogs and people disperse. When it is clear, they move on. Everyone who sees them this evening appreciates them sitting and waiting so patiently on the hill above the path. One set of dogs barks and lunges at them ferociously, but they are leashed and far enough away so that the coyotes don’t react. One set of runners goes by without even seeing them. When it is dark and the path is clear, they slowly get up and descend into the forest and then out into the ‘hood. There’s always drama in coyote lives, but sometimes it’s in routine packets and not life-altering as in some of my other recent posts. 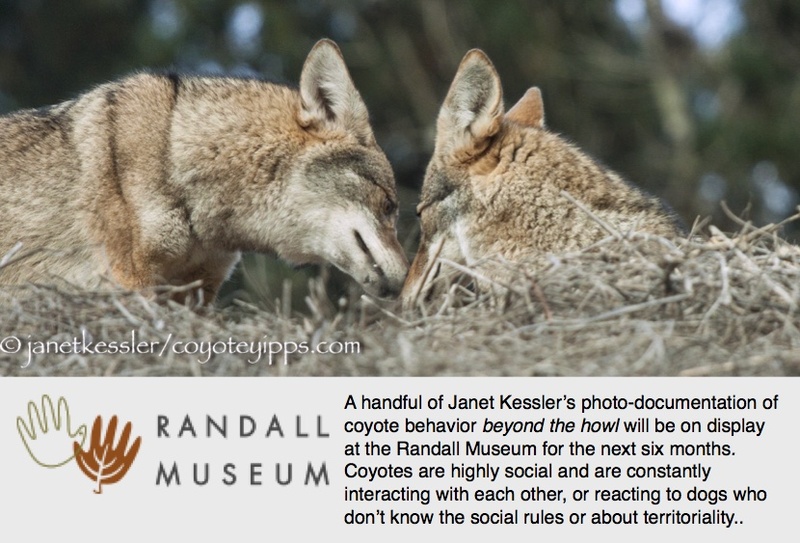 The everyday life of a coyote is a pageant full of activity, emotion, tension, suspense: i.e., a true melodrama. I cried when I next saw the coyote pictured above. She had more wounds and was thin and frail looking. Only a month ago she was so infectiously happy — she brought joy to all who observed her. This is the coyote who was displaced from her own territory by another coyote a month ago, on February 5th. She returned several times, but the newcomer’s presence drove her away each time. Her appearance and demeanor reflect her story: The fur around her entire neck has been pulled and torn — it’s damp from oozing. Through the fur you can see the injuries on her neck front, with a flap of skin hanging down. On the side of her neck is another deep gash. Her legs are covered with wounds. Her face, as you can see here, has a number of lacerations. Everyone who knows this gal knows her upbeat personality. She’s good-willed towards everyone: people and dogs. She has always been sprightly and playful, even as a loner, and when a male arrived she was welcoming, loving and playful with him — incredibly so, to the joy and amazement of all onlookers. Then the intruder came in, displaced her, and, in short, put a crimp in everything she had going for her. Nature is nature, and we have to accept that: that coyotes have their own internal affairs to work out. BUT here there was human involvement which needs to be examined. About the Intruder: We know the intruder had been wandering about for the last little while because she ended up in the Presidio where she was nabbed and radio-collared on January 3rd, even though she was not an inhabitant of that park. At the time she was collared, she was deemed 2+ years of age. And that’s all you need to know about her to understand this story. Ear-tags and radio-collars are used in the Presidio, a federal park in the NW corner of San Francisco. We should be concerned about these gadgets we are attaching to animals for our benefit, because they certainly are not helping the animals. In the first place, capturing the animal for this purpose is a terrifying experience for every animal. Coyotes are wary of humans and won’t let anyone get close to them. For them, capturing them must be a “leading to death” experience. The ear tags: Two 1″ plastic disks are placed on the fur on the inner and outer side of the ear, so this includes the side where sound waves enter the ear. No one is going to tell me that this doesn’t alter sounds, especially for ears as sensitive as a coyote’s. Sound is normally helped by passing over their natural fur, not a piece of plastic. That’s just the sound-wave angle. More on animal hearing. The plastic hardware itself can be irritating and can also pick up and harbor bugs, especially ticks — one of the insects that plague coyotes the most as I’ve written about — and neither the coyote, nor her mate who often helps with the grooming, has any way to reach under those tags to get them off. Infections can be caused by the piercing of the ear, just as they do in human piercings, except that coyotes aren’t monitored for this. A friend of mine saw a coyote with an infected ear caused by a tag. In addition, I’ve been told by several behaviorists that animals may shun/reject other animals who are strangely marked (or deformed). I wonder if ear-tags and collars would have this effect? The collars. These things are not only heavy, they are bulky and cumbersome. I’ve seen coyotes attempt to shake off a collar, either because of it’s cumbersome size and weight around their necks, or because of the irritations caused by the collar itself: abrasions, grit, bugs. These are not domestic animals, so much more gets lodged behind their collars than what we see on our dogs. Ticks love to hide on dog ears and under dog collars — the same would be true for coyotes. But, FOREMOST, a collar can actually change the outcome of coyotes’ lives, for instance, the outcome of a territorial dispute, which is what was involved here. I’ve seen plenty of territorial disputes, but inevitably, it’s the territorial owner who is able to drive out the intruder, not the other way around unless the owners have become old and feeble. Our coyote was in the prime of life, four years old. She could/should easily have driven the intruder away. She herself was wounded severely ON THE NECK, where coyotes intentionally inflict damage. If our coyote tried this tactic on the other coyote, which I’m sure she did, she got a mouth full of hard radio and hard collar. The radio-collar provided armor and a huge advantage to the intruder. The intruder was left unscathed by all appearances. When our coyote returned again to wrestle back her turf, she was met with the same disadvantaged circumstances, and more wounds to herself. Radio collars might be deemed a necessary evil for particular studies — their use should be extremely limited. But they are not needed for “management”, which is what they are purportedly being used for in the Presidio. “Management” requires one thing alone: educating the public to walk away from coyotes and keep their dogs away from them. Coyotes naturally avoid humans unless they are being fed or befriended. Signs, literature, talks are what is needed. Whether or not coyotes are radio-collared, the public will still need to KNOW what to do if they encounter a coyote: they need to walk away from a coyote. Coyotes can move about quickly, so no map is going to show where coyotes are at any particular time. When dens have been discovered and cordoned off to protect coyotes and dogs from each other, it has more often than not been done after the den was inadvertently discovered by the public. Additional management can be added on a case-to-case basis in the few instances when it is necessary. By the way, coyotes will not over-populate any given area — this is because they self-regulate their population through their territorial imperatives. So collars are not needed for population management. The collars are used only to track movements. Since we now know coyotes general movements within the Presidio, and even out of the Presidio to Los Gatos, why are we continuing to collar them? Addendum from a comment I made on FB: I concur that most “scientists” are out to help the animals, even though I know multiple instances of where the “information” is considered more important than the animal. As I said above, learning from a minimal amount of collaring could be useful. But where there are other means, collaring shouldn’t be done because of collateral effects. A researcher’s “good intentions” aren’t enough. Good intentions are often harmful: for instance, feeding wildlife. Collaring is not a benign thing. There are too many things we DON’T know about these animals to be shackling them with our gadgets unless absolutely necessary, and even then it should be minimally. Did you read the article on hearing linked above? There are a lot of things about animals that humans simply don’t have any comprehension about, and that’s because we ourselves are limited by our five senses, and we tend to use ourselves as the gold standard — until we’re surprised, for instance, that elephants can hear clouds. Also, radio telemetry does not reveal their interpersonal behaviors. What I observed in this posting probably goes on a lot — it wasn’t just a one-time fluke that I just happened to see — but few scientists actually spend huge amounts of time watching coyote behavior, which is what it takes: they like their instruments, their data, and crunching numbers. This article was written to let all those folks with good intentions know that they may be creating more harm than they can imagine, specifically with radio-collars. So please use them sparingly, and only if you really have to. Coyote internal affairs are every bit as involved as our own, and much more interesting than the human/coyote/dog interface which is what most people are mostly aware of due to news reports. Their lives can be melodramatic and riddled with thrills! Here’s an example on par with the Hatflieds vs. the McCoys. The newly-arrived one: wary and guarded in her new surroundings, especially after the non-welcome she received from our resident coyote. Few people noticed that a new coyote was around, and no one imagined that this would change the course of the lives of our resident coyotes. What was HER story? Had she left her home of her own volition, or had it been a forced dispersal? Might she have even been driven away from the next place where she tried squatting? How long had her wanderings been? Time-wise at least a couple of months, distance-wise at least over half of the city, according to reports. She was here now, and again according to reports, had been in the area for a good number of weeks before a territorial battle took place. She needed a place to live in order to survive and was probably desperate. I’m trying to keep her point of view in mind here. She appeared to be unscathed from the encounter, whereas the resident female had sustained wounds: maybe this is because the newcomer had already been through this kind of thing before and was practiced, whereas we know the territorial defender — the coyote we knew and had come to love so much due to her very upbeat personality — had led an unchallenged and unperturbed life for 3 years as queen of her park. Both newcomer and the displaced residents (there was a male with her) have been lying low since that fight. For the last couple of weeks, then, mostly out of the corner of my eye, I’ve been glimpsing the newcomer furtively passing through back alleyways, mostly scared and fleetingly. Few other neighbors have actually seen her (or for that matter, even know about her). Several people saw her when I did, but they were unable to recognize her as a different coyote — they simply saw a coyote form: most people cannot identify individual coyotes, even with markers. I’m slowly beginning to see her more and more. Recovering from her wounds, far enough away. Photo by Adrian Parker. The wounded coyote — the one who has been displaced — has been hiding out in a distant green space where neighbors spotted her (and also saw the male, once) trotting up the streets, foraging quietly, or even sleeping in their backyards. She was keeping away and healing. THEN, several days ago, my friend Doug caught a glimpse of the tattered female (see photo below). No one had seen her in the three weeks before this, so we had assumed she had been driven off for good, but we were wrong. What a mess she looked! She was lacerated from head to toe: on her head, neck, and legs. Were these wounds from the fight I documented earlier, or had there been additional confrontations? Her fur might have concealed the extent of her wounds when I first saw them three weeks ago — I don’t remember them looking this bad. Would she now stay? She was seen only for a minute at this sighting, and then disappeared from view. For the next two days, the only coyote we ever saw, glancingly, was the cocky newcomer gal who traversed the park looking very much at ease as she sauntered through. Human glances hurried her on her merry way and out of view fairly quickly (below). Then, surprise, a day later, Miss Tattered and Torn was back, with the lacerations on her face, head, neck, and legs more obvious than ever (below). She was limping and disheartened, but apparently not giving up. As you can see from this posting, coyote internal affairs can be every bit as involved as our own, and much more interesting than the human/coyote/dog interface which is what most people are mostly aware of due to news reports. Watching and documenting them is like watching a soap-opera with cliff-hangers! Hope we’re not in for a long, protracted Hatfield vs. McCoys affair, which, in case you have forgotten or never knew, was a drawn-out human territorial battle way back during Civil War days. It sounds pretty similar to me. As for the newcomer, if she remains, hopefully people won’t feed her or befriend her as they did the previous resident coyote. That coyote had been put in daily danger as she waited for food on the street, approached some people, and even chased cars from which food was tossed. Of peripheral interest: I’ve been following these particular coyotes since their births. The displaced female had come to this territory three years ago, arriving at 9 months of age from a park several miles away where I had watched her grow up in a 3rd generation family, each generation of which I had followed — she was the 4th generation. The male who she is attached to, had arrived only several months ago from his birthplace all the way across the city. At a year and a half of age, he was harshly driven out of his home by his siblings, not by his parents. Even after his arrival here, he continued to wander for days at a time, often three-mile distances in the opposite direction from his birthplace, but this wandering had been diminishing. And then, a New Arrival, an Intruder appeared. Things can change in the blink of an eye. Let’s see how the story unfolds. Male as a 13 month old still at his birthplace. He was forcibly dispersed by siblings at 16 months of age. It’s mating time for the coyotes and, guess what? The female is going through mood swings. A surge in hormones can do this. It sounds eerily familiar, doesn’t it? This female’s normal behavior is to be totally aloof. She goes off on her own on what I call lengthy “pre-treks”, and then comes back to join her mate afterwards. HE has grown conservative and guarded as he has aged, so he’s not out in the open so early as she is. He routinely awaits for her return from her pre-trek to emerge in dimmer light, and then they engage in a greeting which normally entails him approaching her in a dominant stance and her folding over on her side compliantly before they go trotting off together to go hunting. Now, during the mating season, there have been changes in their behaviors towards each other and from one day to the next. For the last week or so, the male has been seen out earlier with the female, keeping a vigilant eye on her and shadowing her much more closely than is normal for him — he seems exceptionally protective and possessive (or jealous and suspicious)! His is an almost overbearing presence compared to her aloofness and independence. On this day, I found her already hunting as I entered the park. When a siren sounded, she yipped in response, and then the male, who was hidden in the bushes, joined the chorus. This is the full length of the howl, and a normal one for these two individuals. It’s just the two of them. It was the female who then ran towards him enthusiastically with amazing little grunts, rubbing the ground, inviting togetherness and rolling in the grass: this display of excitement on her part is not so ordinary for her. They tumble in the grass in affectionate unity, yet also confirming his status as the dominant one. As the evening continued, the male left her side to look around and mark. Just then a dog and owner appeared, and the male coyote hurried out of their way. But the dog then began barking at the coyote, causing the coyote to stand up straight and walk slowly towards the dog. I’m sure this was because of the female’s presence in the distance and its being breeding season. I asked the dog owner to please leash and walk on, which she did, and the incident was over. The male then moved back into the field next to the female, where they sat and watched, and waited for dusk to thicken before walking off together. Four days later there was an about-face on her part: now she wanted to be left alone under no uncertain terms. The video below was taken by my friend Samantha right before I got to the park. In the video, the female grabs the male’s snout causing him to wince in pain: this type of snout-grab is used to impose one’s will on the other — it’s disciplinary. HIS normally dominant status had been trumped by her needs. Mating time is close at hand, and the male can hardly control his need to approach her, but she is not ready. After I arrived, the male repeatedly attempted approaching the female, inching towards her very slowly, cautiously and gingerly, one tiny step at a time. But the minute he was within reach of her, she let him have it with a growl and lunging teeth. Later on, she began snarling at him if he even looked at her from further away, as seen below. After continual repetitions of this same behavior: his approaching and her repulsing him, she walked away with him still tailing her but at a respectable distance until they disappeared in the bushes.